This workshop will explore how craft practices drawn from painting, drawing, and paper-folding can be integrated with electronics design and construction. We will employ new materials like conductive and color-changing inks to create a series of interactive electronic sketches. Through our investigations we will examine how different materials, craft processes, and cultural traditions can influence the form and function of technology. The class will teach participants foundational electronics and programming skills using non-traditional materials and tools. Students will paint, draw, glue, and fold electronic pieces together. We will experiment with building handmade sensors to control lights, colors, and movements, and with writing simple programs to endow pieces with complex dynamic behavior. *Sketchbook and favorite drawing supplies. No previous experience with electronics or programming is required. Leah Buechley is an Associate Professor at the MIT Media Lab where she directs the High-Low Tech research group. The High-Low Tech group explores the integration of “high” and “low” tech materials and processes from cultural, aesthetic, and practical perspectives with the goal of engaging diverse groups of people in developing their own technologies. Leah received her PhD and MS degrees in computer science from the University of Colorado at Boulder and her BA in physics from Skidmore College. At both institutions she also studied dance, theater, fine art, and design. 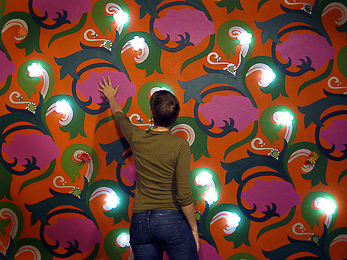 Her work has been exhibited internationally at venues including the V&A London, the Ars Electronica Festival Linz, SIGGRAPH, and the Exploratorium Museum in San Francisco, and has been featured in numerous articles in the popular press including the New York Times, Boston Globe, and Crafts magazine. I delight in unexpected juxtapositions of materials, cultures, and making practices. My work explores intersections – of "high" and "low" technologies, new and ancient materials, masculine and feminine traditions, and improvisational and methodical processes. I strive to disrupt boundaries between engineering, design, craft, and art and to invite people to experiment with and appropriate tools and materials from other cultures. Collectively my investigations also constitute an ongoing exploration of technology, power, and the role of the (creative and embodied) individual in modern society.